Want a great way to experience London, whether you’re a first-visit tourist or a veteran? Check out Sandeman’s New London Tours. The company offers a wide range of walking tours of the city, given by enthusiastic young tour guides (many of them underemployed actors from London’s many theatres) who have an insider’s knowledge of the vast city. Their hallmark tour is the New London Free Tour–yes, you read that right, it is free. 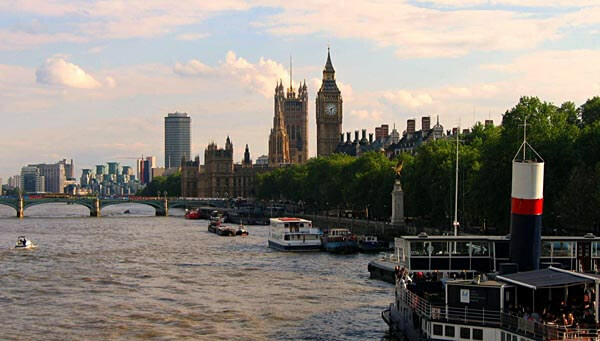 This tour begins every day of the week at 11:00 a.m. at Hyde Park, and winds its way through the city of Westminster, where you will see Parliament and Westminster Abbey, and meet some of the most impressive personalities of the British Empire, from Edward the Confessor to Winston Churchill. What’s the catch? There is none, honestly! If you are happy with the tour, you may give your expert guide a generous tip. Clearly, Sandeman hopes that you’ll be thrilled enough by your free tour to book further excursions with their company. They offer a great variety of thematic tours of the Old City, pub crawls in various regions, and an engaging mix of seasonal tours. During the Halloween season, for example, they featured a Grim Reaper Tour that retraced the trail of Jack the Ripper and an overview of a darker London that was home of the world’s first psychiatric hospital, Traitor’s Gate, and the haunted hideaways of the East End. Fees for these tours are reasonable, generally averaging about 14 pounds a head. Sandeman’s is also more than accommodating in the area of private tours. If you have a particular area or interest, let them know and they will develop a unique tour to suit the needs of your group. Whether you are interested in medieval history or just want someone to show you the best shopping sites in town, Sandeman can help you make the most of your London visit. Contact them at +49 30 5105 0030 or visit their website. Last updated by Mary Van Keuren on 29 March, 2012 in Travel.